Jen is a fan favorite for a reason-- she loves studying mechanical engineering and dreams of inventing the next new thing. Jen also comes with her own matching violet scooter. 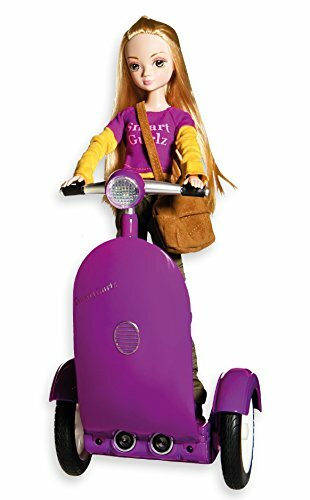 The Smart Gurlz coding doll is the hit STEM educating doll scooter that inspires the young girls of today to be the leaders and creators of tomorrow. Our breakthrough Siggy Robot doll integrates our Sugar Coded app and teaches basics of coding unlike any class or coding camp. Connect to our app to your doll to complete missions, and adventures all while learning and honing coding skills. Smart Gurlz wants to connect young women with technology to groom tomorrows creators and leaders. Meet Jen, a cool handy, teen mechanic who can repair pretty much anything in a jiffy. Jen is studying mechanical engineering and dreams of inventing the next new thing. SmartGurlz® is a brand new line of fashion dolls and self-balancing scooter that engage girls ages 5 and up in Science, Technology, Engineering and Math. SugarCodedTM provides multiple levels of play and learning. E-BOOKS - Learn about individual Smartgurlz® characters through a series of stories. FREEPLAY - Control your Siggy using the direction pad or preset commands. Create and record routines. Save your favorites. PATH - Draw a path and Siggy will follow it. LEARN, SUGAR CODED, and MISSIONS - Learn basic coding logic to execute a series of tasks with easy to use drag and drop Google Blockly commands. Download the kid friendly SugerCodedTM app on any smart phone or tablet (iOS 9+ or Android). Nearly 1 hour of play on a 9v alkaline battery (not included) Box Measures: 13" H x 10" L x 6.5" W.
If you have any questions about this product by Smartgurlz, contact us by completing and submitting the form below. If you are looking for a specif part number, please include it with your message.